Lotus root is the stem of the lotus plant. It is edible and is revered in many Hindu and Buddhist cultures. For optimal results, when incorporating lotus root into your menu, be sure to prepare and cook it properly. When it comes to cooking with lotus root, Nature's Pride recommends starting with a high-quality product. Lotus roots should have a firm texture and appear plump and juicy with no soft spots. Store lotus root in a cool place, such as the refrigerator. Prepare within one week of purchase. Before incorporating in a recipe, rinse lotus root with cool water. Then use a sharp vegetable peeler or paring knife to remove the reddish-brown exterior from the lotus root, leaving the white interior exposed. Though not a necessity, Serious Eats notes that soaking lotus root in a vinegar bath after rinsing with cool water and removing the exterior can help to maintain its white flesh, making it more visually appealing for some diners. Lotus root can be cooked in a number of ways, including boiling, baking, or frying. Stir-frying is one of the most traditional ways in which lotus root is cooked, notes Serious Eats, as the tender yet crunchy texture of the vegetable is maintained. In this technique, The Kitchn recommends cutting the vegetable crosswise into quarter-inch slices, and placing in a pot of vinegar water that has been brought to a boil. Cook the slices of lotus root for three to five minutes, or until they are crisp-tender, and add to a salad of mixed greens or combine with soy sauce, rice vinegar and sesame oil and serve over rice. The Blenderist notes you can simply slice them like you would a potato, into thin chips and then coat them with the seasonings of your choice - like a mixture of olive oil, salt and other spices as desired. Bake the lotus root slices at high heat for 20 to 22 minutes, turning them over halfway through the cooking process. To stir-fry with lotus root, cut the vegetable crosswise into quarter-inch slices, and cook in a small amount of oil over medium-high heat for two to three minutes. Other crisp, tender vegetables - like asparagus, snow peas and carrots - can be added to the lotus root to highlight the signature crunch. Add liberal amounts of wine and oyster sauce to enhance the mild taste of the lotus root, recommends Serious Eats. Lotus root can be easily substituted in recipes that call for other, mild-tasting root vegetables, like parsnips, rutabagas and turnips. Similarly, lotus root can be added to recipes that already rely on the use of root vegetables. Lotus root is especially good when used in soups and stews, as it easily absorbs the flavors of the liquids in which it is cooked. Lentil and Vegetable Soup - Soak the lotus root in a vinegar bath for five to ten minutes before substituting it for the rutabaga in this recipe to maintain its white flesh. Instead of chopping the lotus root, you may want to slice into thin, 1/8-inch crosswise slices with a sharp knife or mandolin to highlights its trademark 'lacy' interior. Fried Turnips - Rinse, peel, and soak lotus root in a vinegar bath for five to ten minutes before substituting for turnips in this recipe. Use a sharp knife to cut the lotus root crosswise into one-inch pieces before adding to the skillet. Beef Stew with Potatoes and Parsnips - Rinse, peel, and soak lotus root in a vinegar bath for five to ten minutes before substituting for parsnips in this recipe. Use a sharp knife to cut the lotus root crosswise into 1/4-inch slices before adding to the oven-proof pot. Try this recipe to get a good feel for how versatile lotus root can be. In a large stock-pot, bring vegetable broth and soy sauce to a simmer over low heat. Add the carrots and allow them to cook for eight to ten minutes. At the same time, rinse the lotus root with cool water, then peel the skin and cut crosswise into 1/4-inch slices. Place the slices into water that contains a dash of lemon juice or vinegar to prevent discoloration. Let them soak for five to ten minutes. Drain the lotus root, and rinse with cold water. Place in the stockpot with the mushrooms and bok choy. Turn off the heat and cover the stock-pot quickly with a tightly-fitting lid. Allow the vegetables to 'steep' for about five minutes. Place 1/4 of a cup white rice in the bottom of a soup bowl. Carefully pour soup on top of the rice. Serve immediately. 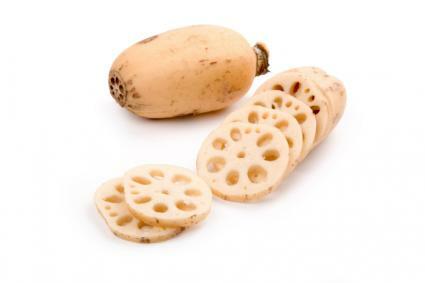 Individuals who are looking to be more creative in the kitchen can't go wrong with the use of lotus root. Though it may be intimidating to use at first, lotus root is actually a fairly versatile root vegetable. As with other new ingredients, be prepared to take chances and experiment with this unique product. After trying it once, you'll be coming back for more.